With over 30 years of made in the USA excellence, Lanel is a highly respected name in Salons and Spas for their durable nail dryers. Now, they introduce new and improved models and a brilliant 5 year warranty to ensure the best manicure and pedicure results possible. New features include fans that come on with 50% more airflow and heat. 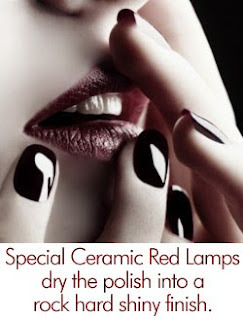 Special Ceramic Red Lamps work with 110VAC Turbo Jet Air to evaporate thinners in polish and dry nails in minutes. Lanel's professional nail dryers have everything you need to ensure your clients' nails dry quickly, while leaving them with a hard, long lasting, glossy finish. Reduce your clients waiting time while ensuring their nails come out smooth and glassy... free of smudges or bubbles. Top coat to Base Coat, Nail Polish is dried down to a rock hard, long lasting finish. New super charged 110VAC Turbo Jet Air fans deliver increased airflow for drying polishes down faster than ever before. The Red Ceramic bulbs give off UV light AND heat, ensuring faster dry times and a smooth baked in color that leaves nails with a glassy finish clients LOVE. Also cures UV top coats. Faster dry times mean busy Salons can accommodate more clients at a faster rate, increasing profits. Plus your clients will be thrilled to leave a bit sooner! 5 year warranty. According to Lanel, their fans/motors will last 5-10 years in the busiest salons...they only use the highest quality motors that will not burn out. This also accounts for the slightly higher price tag than other economy brand dryers with 12 month (or no) warranties.